The aim of this study was to carry out a survey that would provide valuable insight on current practices in dental radiology. Due to previous limited information on dental radiology in Saudi Arabia the results would help to form appropriate recommendations for further improvements. It was decided that the survey questionnaire should be sent to the full population of dentists (462) in Jeddah in order to get a significant number of responses. Since all the registered dentists in Jeddah were surveyed therefore sampling error does not exist. In order to facilitate a high response rate, a short questionnaire was designed. The cover letter and questionnaire was provided in both English and Arabic, explaining the MSc research project and details of the project supervisor. The cover letter stated that by completing the questionnaire the participating dentists would be giving their voluntary consent to participate in the study. Keeping in mind the time constraint, difficulty in obtaining registered dentists' names and postal addresses, unreliable postal system and anticipated low response rate to a postal survey, it was decided to deliver and collect the questionnaires by hand. Personal delivery of questionnaires to each clinic resulted in good response rate, especially in the private sector. In the government sector, the distribution and collection of the survey questionnaire was done by the relevant Graduate Study Departments and the author was not allowed to directly interact with the respondents. This contributed to the lower response rate in the government sector. 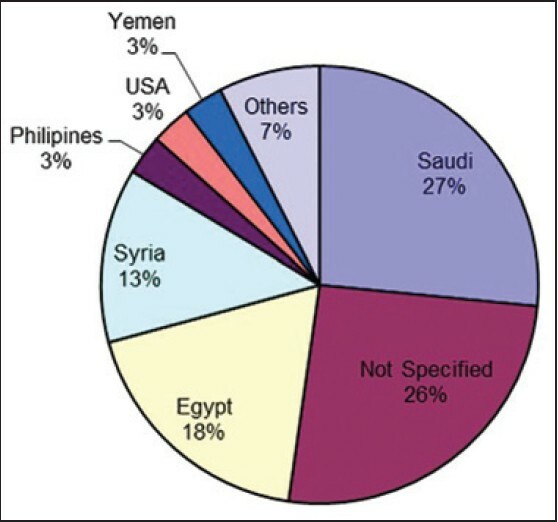 The division of registered dentists in government and private sector in Jeddah is shown in [Figure 1]. 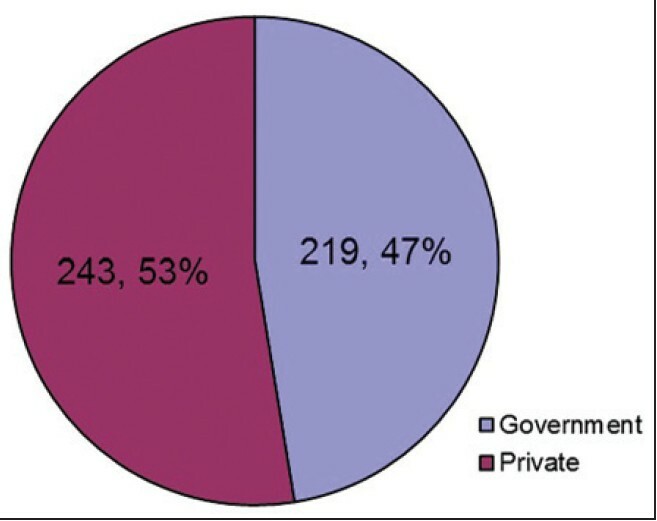 The number of dentists surveyed in Jeddah in the private and government sector and the number of responses received along with their percentage is shown in [Figure 2]. Distribution by year of graduation from dental school of respondents is shown in [Figure 3]. The country of qualification of survey respondents in government and private sector along with the relative frequency is shown in [Figure 4]. Most commonly used technique in intraoral periapical radiography results are, paralleling 75% (government 83%, private 69%), bisecting 25% (government 17%, private 31%). Six respondents did not answer the question and 5 answered both techniques. Frequency is shown in [Figure 5]. Use of beam alignment device if using paralleling technique showed 55% used it (government 47%, private 61%). About 45% do not use it (government 53%, private 39%). Ninety-five respondents did not answer the question as 89 were using only bisecting technique and 6 did not answer the first and second question. Frequency is shown in [Figure 6]. Type of intraoral image receptor used showed film packets 79% (government 75%, private 82%), digital phosphor plates 4% (government 6%, private 2%) and digital solid state detectors 17% (government 19%, private 16%). Thirty respondents have answered two options. Frequency distribution is shown in [Figure 7]. Speed of film used are D speed 14% (government 10%, private 16%), E speed 36% (government 25%, private 43%) F-speed 5% (government 0%, private 8%). "Don't know" answers 45% (government 65%, private 34%). Two respondents have answered two options. Frequency distribution is shown in [Figure 8]. Type of film processing showed manual 76% (government 69%, private 79%), automatic 24% (government 31%, private 21%). Twenty-five respondents chose both answers and 5 respondents did not answer the question. Frequency distribution is shown in [Figure 9]. Type of collimator showed circular 50% (government 42%, private 56%), rectangular 8% (government 5%, private 9%) and don't know 42% (government 53%, private 35%). Frequency distribution is shown in [Figure 10]. kVp used by dentists are: 5% used 50 kVp (government 3%, private 6%), 13% use 60 kVp (government 6%, private 17%), 6% use 65 kVp (government 6%, private 6%), 25% use 70 kVp (government 16%, private 31%), 20% opted for variable kVp (government 24%, private 19%) and 31% don't know (government 45%, private 21%. Frequency distribution is shown in [Figure 11]. The person responsible for taking intra oral radiograph are dentist 39% (government 20%, private 57%), dental assistant 58% (government 75%, private 46%) and others 3% (government 5%, private 2%). 29 respondents answered two options and 1 respondent answered all three options. Frequency distribution is shown in [Figure 12]. The person wearing radiation film badge to measure radiation exposure are 32% (government 40%, private 26%), while 68% didn't wear (government 60%, private 74%). 3 respondents did not answer the question. Frequency distribution is seen in [Figure 13]. The patient wearing lead apron during intraoral radiography is 54% (government 59%, private 51%), while 46% didn't wear (government 41%, private 49%). Frequency distribution is shown in [Figure 14]. The intraoral radiographs viewing method are light box 70% (government 70%, private 70%), background light 10% (government 5%, private 13%), computer monitor 20% (government 25%, private 17%). 41 respondents chose two options. Frequency distribution is shown in [Figure 15]. The dental clinics having panoramic X-ray machine are 94% (government 95%, private 94%), while 6% didn't have (government 5%, private 6%). Frequency distribution is shown in [Figure 16]. Person responsible of taking panoramic radiographs showed dentist 6% (government 3%, private 8%), dental assistant 72% (government 65%, private 76%), others 22%(government 32%, private 16%). Fourteen respondents chose two options. Frequency distribution is shown in [Figure 17]. The use of lead apron in panoramic radiography is 74% (government 74%, private 73%), not use by 26% (government 26%, private 27%). 1 respondent did not answer the question. Frequency distribution is shown in [Figure 18]. Dentist who read the dental radiology manual of Saudi Arabia showed 34% said yes (government 35%, private 33%), 66% said no (government 65%, private 67%). Frequency distribution is shown in [Figure 19]. This survey analysis provides valuable insight on practices followed in dental radiology in Jeddah, Saudi Arabia. As the questionnaires were delivered by hand and the author personally followed-up for responses, an overall healthy response rate of 81% was achieved. However, the response rate from the government sector was lower (67%) compared with the private sector (93%). The year of graduation was not specified by 30% of the respondents (27% government sector, 31% private sector). An analysis of the responses where the year of graduation was given reveals that for the private sector, the highest proportion (38%) had graduated in the decade from 1992 to 2001, whereas in the government sector, the highest proportion (55%) had graduated in the decade from 2002 to 2011. Indicating that number of years of experience of private sector was more compared to the government sector. This result can be explained by the fact that most of the government sector dentists were Saudi nationals, whereas in the private sector, most were expatriates. Since the first dental college started in Saudi Arabia in 1975 and the number of students started building up over the years, a higher proportion of Saudi dentists have graduated in the last 10 years. A comparison of results by year of qualification of dentists showed that those who qualified between 1972 and 1991 had relatively better knowledge and awareness, followed better practices and were more directly involved in taking radiographs compared with those who had qualified in later years. 26% had qualified from Saudi Arabia (65% government, 2% private) followed by 18% from Egypt and 13% from Syria. Among the non-Arabic speaking countries 3%, each, qualified from Philippines and USA. Other countries of qualification are Yemen, Jordan, Lebanon, India, Russia, Turkey, Ukraine, Chile, Germany, Iraq, Kazakhstan, Pakistan, Sudan, and UK. A comparison of results by country of qualification of dentists showed that those who qualified from Saudi Arabia had relatively less years of experience, lower awareness (reflected by the high proportion of "do not know" answers), and were less directly involved in taking radiographs compared with those qualified from other countries. Majority of dentists (75%) use the paralleling technique, more pronounced in the government sector (83%) when compared with the private sector (69%). One of the reasons for the slightly lower use in the private sector may be due to more diversity in the country of qualification of the dentists. The paralleling technique has diagnostic advantages over bisecting technique. These are mainly, geometrically accurate image with minimal distortion and reproducible radiographs. In periapical radiography paralleling technique should be regarded as the technique of choice. The high percentage of dentists opting for paralleling technique in Saudi Arabia shows that they are in accordance with the current UK recommendations. Just more than half (55%) of the dentists used beam alignment device. The use is more common in the private sector (61%) compared with the government sector (47%). One of the reasons of high use in the private sector dentists could be the cost and time saving resulting from lower retakes and resultant lower patient dose. Current usage of beam alignment (55%) is not in accordance with the UK guidelines. 4% use digital phosphor plates (6% government, 2% private). 9% (0% government and 12% private) were using "F" speed. Comparative analysis between government and private sectors does not reveal a significant difference in use of D- and E-speed. However, the F-speed is only being used in the private sector. There is a need to increase awareness among dentists in Saudi Arabia to use high speed films (E or F) as this would result in reduced patient dose. ,, The image quality of both E- and F-speed film is same, but radiation dose is further reduced with F-speed film. , The proportion of dentists who do not know the speed of film used is worrisome. 7% (5% government, 8% private) use 50 kVp. This shows that 63% dentists (52% government, 68% private) are operating within the recommended range of 60-70 kVp. It is recommended that tube voltage for intraoral radiography should not be lower than 50 kVp and ideally it should operate within the range of 60-70 kV. 7% of intraoral radiography is being done at 50 kVp, which shows that there are still some old machines being operated as the new equipment in Jeddah, Saudi Arabia usually starts from 60 kVp and above. In 32% of cases, the person taking radiographs wear a film badge. This proportion is higher in the government sector (40%) compared with the private sector (26%). This difference is due to excessive workload in the government sector in taking dental radiographs, which requires monitoring of staff for dose constraints. Almost all dentists (94%) have panoramic X-ray equipment. This proportion is same for the government sector (95%) and private sector (94%). Overall only 6% of dentists (8% private, 3% government) were taking panoramic radiographs themselves. In 74% of cases (74% government, 73% private) the patient is made to wear a lead apron during panoramic radiograph. Results show that percentage of lead apron wear in panoramic radiography is higher (74%) then in intraoral radiography (54%). About 66% of dentists reported (67% private, 65% government) that they had not read the dental radiology manual. This shows that there is a need to spread awareness about best practices and recommendations in dental radiology as practiced in UK. • 66% of respondents had not read the locally available dental radiology manual. There is obvious need for improvement in undergraduate education level as well as the establishment of postgraduate courses on dental radiology. 1. Quality assurance programs and audit system should be established. 2. Guidance notes on dental radiology should be formed locally to help dental practitioners implement good practice guidelines similar to UK. 3. More survey studies should be carried out to further investigate the various aspects of dental radiology to establish reasons for practices, which are below recommended standards and in order to formulate appropriate corrective actions. 4. Qualified dental radiologists should teach the undergraduate students and continuing education programs should be established for dentists, dental assistants and radiographic technicians providing the latest information on radiation safety, new equipments, and techniques. 1. ptw.de. PTW Freiburg GmbH, c2012. Available from: http://www.ptw.de/kacst.html. [Last updated on 2012 Feb 14; Last cited on 2014 May 23]. 2. Radiation Safety Manual. Riyadh (Saudi Arabia): King Faisal Specialist Hospital and Research Center, c2012. Available from: http://www.rc.kfshrc.edu.sa/bpd/document/RSO/RSO%20Manual%20New.pdf. [Last cited on 2014 May 23]. 3. Faculty of Dentistry. Jeddah (Saudi Arabia): King Abdulaziz University, c2014. Available from: http://www.kau.edu.sa/files/0/KauGuides/Faculty%20of%20Dentistry.pdf. [Last cited on 2014 May 23]. 4. moh.gov.sa. Ministry of Health Kingdom of Saudi Arabia; c2014. Available from: http://www.moh.gov.sa/en/Ministry/Statistics/Book/Pages/default.aspx. [Last updated on 2013 Mar 06; Last cited on 2014 May 23]. 5. Whaites E. Periapical radiography, image receptors, dental X-ray generating equipment, radiation protection and legislation, introduction to radiological interpretation. In: Parkinson M, editor. Essentials of Dental Radiography and Radiology. 4 th ed. London: Churchill Livingstone; 2007. p. 115, 44, 36, 72-9, 245. 6. Faculty of General Dental Practitioners The Royal College of Surgeons of England. Use of ionising radiation, good practice. In: Pendlebury ME, Horner K, Eaton KA, editors. Selection Criteria for Dental Radiography. 2 nd ed. London: Faculty of General Dental Practitioners The Royal College of Surgeons of England; 2004. p. 13-26, 83. 7. White SC, Pharoah MJ. Digital imaging, health physics, guidelines for prescribing dental radiographs. Principles of radiographic interpretation. In: Rudolph P, editor. Oral Radiology, Principles and Interpretation. 5 th ed. St Louis: Mosby; 2000. p. 225, 57-9, 275, 282. 8. Mutyabule TK, Whaites EJ. Survey of radiography and radiation protection in general dental practice in Uganda. Dentomaxillofac Radiol 2002;31:164-9. 9. Ilgüy D, Ilgüy M, Dinçer S, Bayirli G. Survey of dental radiological practice in Turkey. Dentomaxillofac Radiol 2005;34:222-7. 10. Casanova MS, Haiter-Neto F. Effects of developer depletion on image quality of Kodak Insight and Ektaspeed Plus films. Dentomaxillofac Radiol 2004;33:108-13. 11. Price C. Sensitometric evaluation of a new F-speed dental radiographic film. Dentomaxillofac Radiol 2001;30:29-34. 12. Salti L, Whaites EJ. Survey of dental radiographic services in private dental clinics in Damascus, Syria. Dentomaxillofac Radiol 2002;31:100-5. 13. Parrott LA, Ng SY. A comparison between bitewing radiographs taken with rectangular and circular collimators in UK military dental practices: A retrospective study. Dentomaxillofac Radiol 2011;40:102-9. 14. Hellén-Halme K, Nilsson M, Petersson A. Digital radiography in general dental practice: A field study. Dentomaxillofac Radiol 2007;36:249-55.